It’s the March! 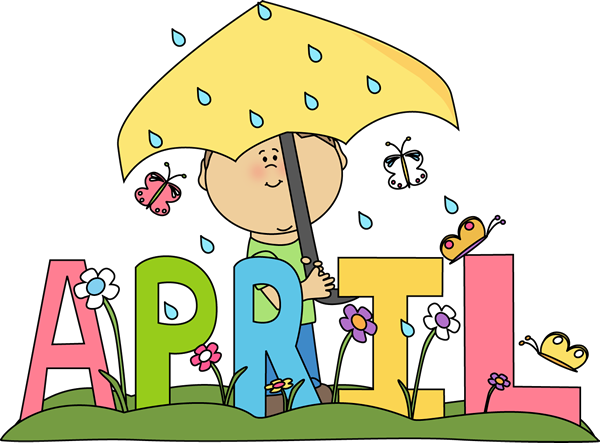 March! …March of the BookMarks! 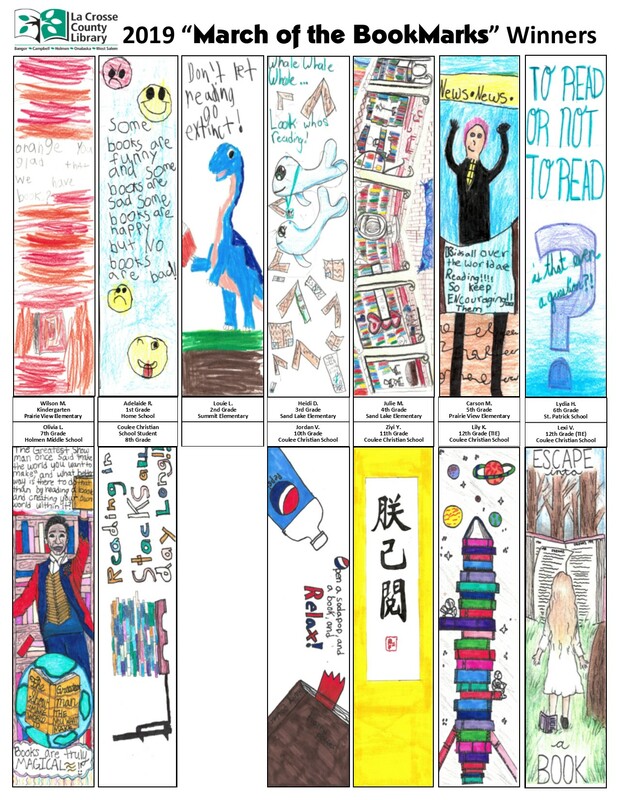 Annual Bookmark Contest Winners! Over 2100 bookmarks were submitted during the month of March, with a winner chosen from each grade. We awarded 127 Honorable Mentions to area students for outstanding work. See the winning bookmarks as well as the other entries that were submitted at each location. Winter 2018/Spring 2019 Programming Calendar is Here! 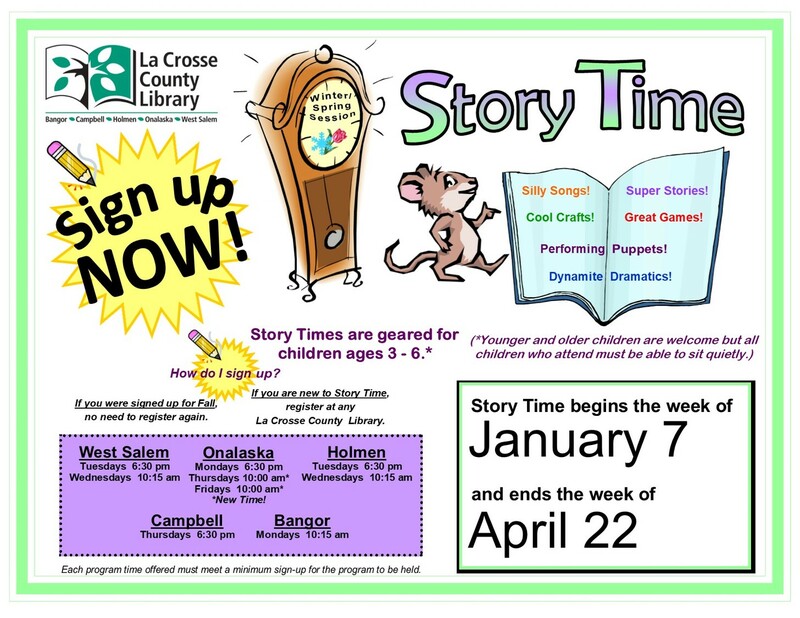 Fall & Winter/Spring Story times run during the school year and are geared toward children ages three through six, and include stories, creative dramatics, songs, simple crafts and more. Days and times of scheduling may vary slightly from session to session based on need or demand. A minimum number of children must sign up for a session to be held. Check the schedule for the current session nearest you. Summer Story times run in conjunction with the Summer Library Program. How you and your child can get the most out of the Storytime experience including Read-Aloud Tips for home! "Tales for Twos" a lap-sit storytime for two-year-olds is held during the fall and winter. Any schedule listed would be for the current season. Teen Programs are intended for youth in grades 7-12. 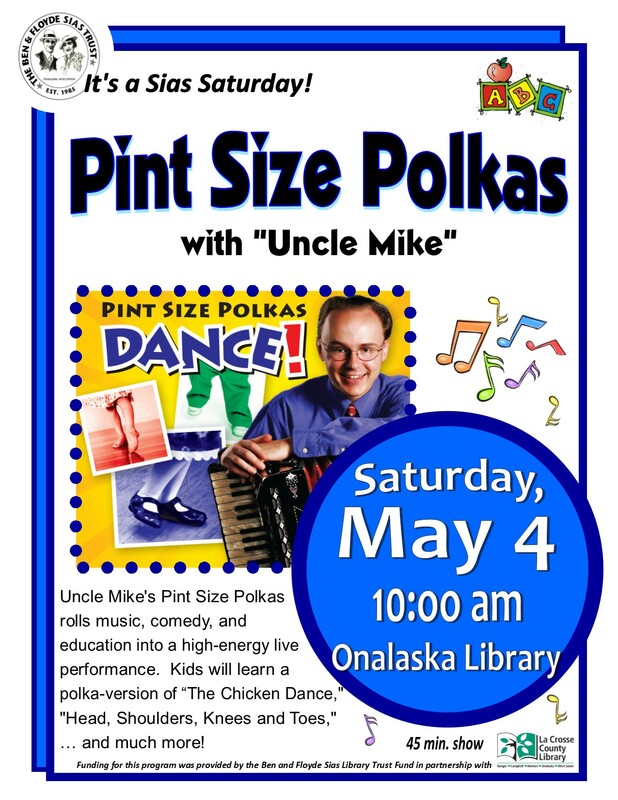 They are primarily held at the Onalaska branch but are open to all teens in Bangor, Campbell, Holmen, Onalaska, West Salem and other communities in the area. See the schedule (above) for the current season. The Summer Library Program is intended to keep youth reading and using the library throughout the summer months. Each summer hundreds of youth participate. The Summer Reading Program includes Lunch Bunch, Snack Pack, Library Club, Storytime, and family Main Events, beginning in June and running through early August. We also offer teen events. Check the schedules in the spring for times and locations. Check back this winter when we announce our 2019 Summer Program theme! Special programs and no-school day activities are geared for different age groups, depending on the program. These programs include crafts, storytelling, movies and other activities. Watch for further information and sign-up lists at your local library. Check the schedule or Special Programs for specific times and dates. Schedules are for the current season. Booklists are suggested reading in various categories provided by our Youth Services Librarians, New York Times Best-sellers list, etc. Click on "Booklists" in the blue buttons at the top of the page. Reader's Advisory is a service to assist young people and their families, and those who work with children, in selecting reading materials. Stop by to talk with a youth services librarian at the Library’s youth services desks in Onalaska, Holmen, and West Salem, or before and after youth programs at any of the five County Library branches. They will be happy to recommend books and other materials for children and teens with regard to abilities, age levels, and interests. Youth Services Staff travel to each of the five library locations to conduct programs, select and maintain books and other materials, conduct Reader's Advisory, and provide many other services for children, teens, and their families.